LONG SPRAY DISTANCE&WIDE COVERAGE:Our lawn sprinkler has automatic 360 degree rotating function,with long spray distance up to 26ft-32.8 ft(cover about 3,600 square feet) with international standard pipes and 80 PSI water pressure.NOTE:You can also connect 2 or more garden water sprinklers to extend the irrigation area. More STABLE&EFFECTIVE:Water sprinklers with spike base are more stable than those butterfly base lawn sprinklers.You can insert the sprinkler deep into your grass land and bad weather with strong wind,heavy rain will have no impact on it.We adopt sturdy and durable ABS material,non-toxic,no peculiar smell. SPRAYING ANGLE CAN BE ADJUSTED:With 3 leak free design arm sprayers which can be adjusted 15-45 degrees to control spray speed and direction,saving your precious time and water resource at the greatest extent. 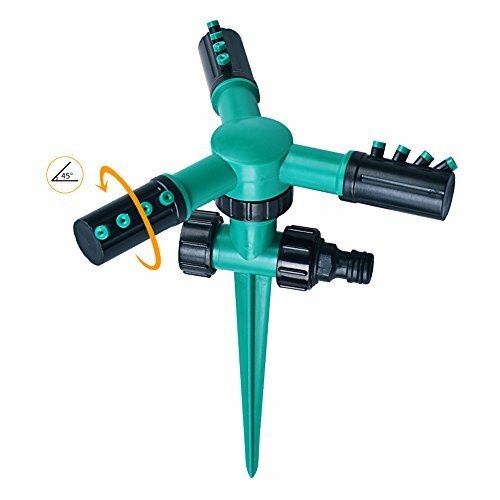 EASY TO INSTALL:Very easy to install.Firstly,combine the rotary triple arm nozzle and the spike base.Secondly,just connect water joint to the connector and tap.Then you turn on the tap and the 3 arms sprayer will automatic rotating.NOTES:Spray distance depending on water pressure. MULTI-PURPOSE:Our irrigation equipment is available in lawn irrigation, farm and garden watering,like any good summertime sprinkler, it can also be used a \'shower toy\' for kids playtime.Customer Assurance:If there are any problems with our products,please feel free to contact SELLER,we\'ll serve you best services and provide you a reasonable solution. Though the sprinkler feels very light weight, it functions perfectly well & stays put while it's on.